'Presents an abundance of effective strategies for adapting instruction such that children with disabilities, those who exhibit behavioral or motivational problems, or those who speak a language different from English will succeed in every classroom. If American schools are truly to educate all children well, then all teachers need to use these powerful ideas for differentiating instruction effectively. This text provides the tool kit every elementary teacher needs to achieve this goal' - Richard Allington, Professor of Education, University of Tennessee, Knoxville Teachers have the power to change lives, particularly for struggling learners who have difficulty understanding how education broadens their future opportunities. This book offers educators a deeper awareness of the role they play in breaking the cycle of failure for students who are unsuccessful in school. Written in a supportive tone, this volume helps primary school teachers effectively reach and teach struggling students. 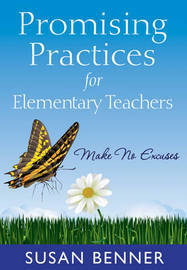 With real-life vignettes, in-depth case studies, and reflective practice scenarios and questions, this book includes: - A broad spectrum of alternative instructional strategies for all learners, including fostering parental involvement, multi-tiered instruction, peer learning models, and universal design for learning - Effective approaches for fostering student success before a child is referred to special education - Practices and programmes that address the needs of at-risk populations, including English language learners and other children of non-dominant cultures, children living in poverty, and learners with disabilities - Specific interventions and positive support for learners with behavioural challenges Promising Practices for Elementary Teachers is an empowering resource for educators determined to bring hope and encouragement to all learners. Susan Benner grew up in Atlanta, Georgia during a period of significant social change and racial unrest throughout the country. She earned her BA in Social Sciences at Southern Methodist University and MS in special education from The University of Tennessee. After teaching as a special educator in Memphis, Tennessee, she received her Ed.D. in special education from Teachers College, Columbia University. Since 1980, Dr. Benner has been at The University of Tennessee, where she is Professor and Department Head for Theory and Practice in Teacher Education. Dr. Benner has published three textbooks, including Issues in Special Education Within the Context of American Society and Assessment of Young Children with Special Needs. She is currently a coeditor of the Journal of Early Childhood Teacher Education, affiliated with the National Association for Early Childhood Teacher Education. Dr. Benner's areas of interest are teacher education, including special and literacy education, and urban teaching. She is principal investigator for several grants, including one focused on teacher professional development in literacy and system-level development of Response-to- Intervention models. She is co-principal investigator for a National Science Foundation Robert Noyce Scholarship Planning Grant to develop urban teacher residency programs in two East Tennessee school districts. Dr. Benner has two daughters, a son-in-law, and four grandchildren, from whom she learns new lessons every day.